If you’re unlucky enough to have your lawn invade by funnel ants, it can difficult to know what to do. Maybe you’ve tried various options from the hardware store but with limited effect. Then during a dry period, you think they’ve gone, only for their funnels to explode again when the first rains arrive. The good news is that a professional funnel ant treatment can deliver very long lasting control. Rather than waste money on products that don’t work, give AllPro a call to get a quote for your property. What damage can funnel ants do? Once funnel ants become established they can cause serious issues. Not only are the funnels very unsightly, but the nest chambers and tunnels they build underground can be quite extensive. These nest chambers can significantly effect the soil structure and cause it to collapse, leaving an uneven surface, potentially causing injury such as twisted ankles and damage to mowing equipment. Of course if you are trying to sell your home it can effect property prices as well! The funnel ant treatment from AllPro Pest Control will eliminate funnel ants from your lawn in 1-2 weeks and provide lasting protection for at least a year. Although control is normally achieved in a single treatment, in cases of severe infestation, two applications may be necessary. The length or protection achieved depends on two factors; the level of funnel ant infestation in surrounding properties and the environmental conditions (amount of rainfall being a major factor). With the extensive subterranean chambers and tunnels, re-invasion from surrounding properties will eventually occur. To achieve the best level of control, it makes sense to treat all the effected properties at the same time…… so it pays to be on good terms with your neighbours! Treatments are based on the size of the area to be treated. How to get rid of funnel ants? Many homeowners struggle to control funnel ants because the products available in supermarkets or hardware stores use old technology. The insecticides tend to be repellent and provide limited duration of protection. Although they may kill a few ants, they do not control / kill the nest. As a result, the ants soon return when the repellency wears off. New products only available to professional pest controllers are non-repellent. This is important as it ensures you don’t just kill a few ants, but can eliminate the entire colony. The products are applied to the soil and as the ants cannot detect their presence, they come into contact with the insecticide when they tunnel through the soil. It doesn’t kill the ants immediately, they still have time to actually transfer the insecticide to nest mates when they contact each other. This spreads the insecticide around the nest, eradicating the entire colony. With their long residual performance in the soil, these treatment eradicate the funnel ant problem and stop new ants moving in for many months, often for a year or more. We used Termidor, the trusted name in termite and ant control, for all of our funnel ant treatments. Pets and children need to be kept clear of the area during the treatment and until the product is “watered-in”, once it is in the soil, children and pets are free to play again! However, before we do any treatment we assess your particular situation and discuss any specific concerns you may have. What are funnel ants and why are they attacking my lawn? There are several species of funnel ant in Australia (Aphaenogaster species), so called because of the funnels of earth or sand they make as they build their nests. 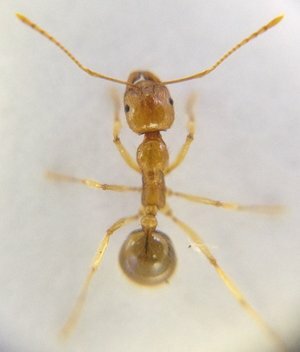 In fact, the ants are quite “shy” and are often never seen, mainly living underground and feeding on plant roots and the sugary secretions from aphids that feed on the roots of grasses. 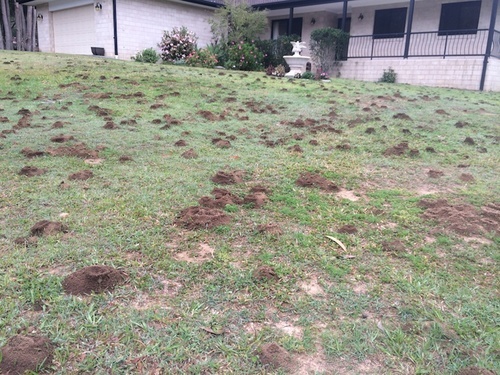 It may seem a bit of a mystery as to why they attack some suburbs more than others and indeed why they hit your lawn, whilst the neighbour’s lawn can remain untouched. It comes down to the combination of grass type, soil type and amount of moisture in your lawn. The right combination creates a perfect environment for the root aphids and that’s when the funnel ants move in.